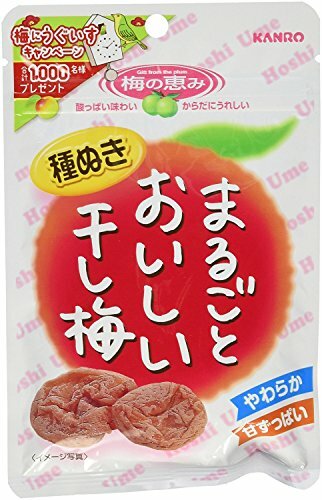 You have reached Kanro Dried Umeboshi (Pickled Plum) - Hoshiume - By Kanro From Japan 30g in Findsimilar! Our expertise is to show you Misc. items that are similar to the one you've searched. Amongst them you can find Sheet 14g ~ 6 bags of eye factory umeboshi, Japanese Plum Hard Candy Koume, 2.39oz, Ribon Nama Ume Plum Hard Candy, 3.87 Ounce, Nobel Otoko Ume Candy 2.8oz (3 Pack), Clearspring - Organic Japanese Umeboshi Plums - 200g, Eden Foods Umeboshi Plums, Whole, 7.05 oz, S&B Japanese Seasoning Paste Series in Plastic Tube (Ume Paste), Jade Sweet Li Hing Mui Dried Plums 5 Ounces, Red Li Hing Mui Plum - 8.5 ounce bag - Packed fresh in Hawaii - Dried asian plums make a perfect addition to lime, lemon, or orange - Plenty of fruit meat with little pit, OUZ123 Office Snack Food Preserved Sweet Plum Pulps Tian Mei Bing 甜梅餅 150g/5.29oz, all for sale with the cheapest prices in the web.